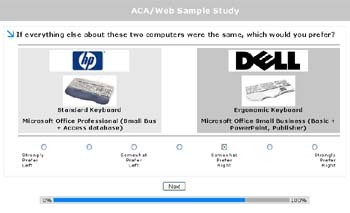 ACA is a computer-administered, interactive conjoint method designed for situations in which the number of attributes exceeds what can reasonably done with more traditional methods (such as CBC or traditional conjoint—CVA). ACA focuses on the attributes that are most relevant to the respondent and avoids information overload by focusing on just a few attributes at a time. Our ACA software is a component within our SSI Web suite of tools. It is typically used for product design and segmentation research, where the number of attributes exceeds about six. ACA is not commonly used for pricing research, as it can tend to understate the true importance of price. Read more about the Adaptive Conjoint (ACA) methodology or download the ACA Technical Paper. If you are having trouble deciding which conjoint method might be best for your specific situation, try our interactive advisor.